The New York City nu-gaze trio Blonde Redhead are planning a September 9th release date for their ninth, that’s right ninth, studio album Barragán.. The 10-track Barragán is the follow-up to 2010′s Penny Sparkle, seems like the band has been away longer than that. The three piece is plotting a World Tour that kicked off in Singapore on June 14. Denver on July 27 is the only U.S. date listed thus far. I will add Blonde Redhead to my Coachella 2015 Perfect Poster wish list, never seen them live. Below are two tunes: the first is the track “No More Honey,” the lead single from Barragán, and second is “23,” one of my favorite tunes from the Zero’s decade. 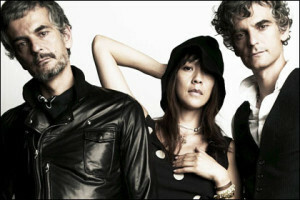 “23″ is the title track off Blonde Redhead’s seventh studio album released in 2007. BTW, is it just me or is there a trend starting with new music from bands that last released albums in 2010? In the last two weeks we have Spoon, Interpol, The New Pornographers, and now Blonde Redhead. Not complaining, just sayin.